Mitral valve prolapse is a malfunction of the heart's mitral valve, the physical doorway between the heart's left atrium and left ventricle. Normally, the mitral valve closes when the ventricle's muscles contract, preventing blood from flowing back into the left atrium when the heart pumps blood to the rest of the body. 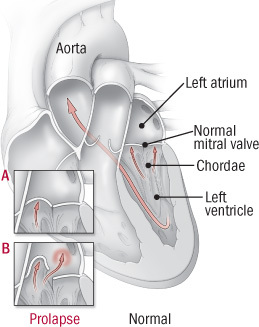 In mitral valve prolapse, however, a slight deformity of the mitral valve prevents the valve from closing normally. This appears as an abnormal floppiness, or prolapse, of the valve. The result is that small amounts of blood leak back into the left atrium, with very little effect on the heart's overall ability to pump blood. In some people, the leak worsens to create a significant backflow of blood into the left atrium. This is called mitral regurgitation. People with severe mitral regurgitation can develop symptoms such as shortness of breath, fatigue and leg swelling. Rarely, heart surgery is needed to repair the damaged valve.